Novomatic keeps players on their edge of their seats with their horror-themed release, Vampire Fortunes. It’s a volatile 5 reel, all ways pays video slot that comes with special wilds that double payouts and a free spins round with high value symbols only as well as offering a shot at landing 1 of 4 potential jackpot prizes. Play on your computer, tablet or mobile from between 50p and £5 per spin. The design in Vampire Fortunes is simply done. With a graveyard at night in the background, you’ll see A to 9 royal values as well as rings, gemstone-style bats, chalices full of who knows what and bottles of potion. The blood sucking female vampire is the best paying standard symbol. Land 3, 4 or 5 in combination for a payout of 1, 3 or 12 times your bet. Helping move things along are 2 different types of wild. The standard blue wild can land on reels 2 and 4 only. This substitutes for all of the standard symbols. It’s joined by the red wild which can land on reel 3 only. This red wild delivers a 2x multiplier boost and doubles the payout when it forms part of a winner. The crystal ball is the scatter. Land 3, 4 or 5 of these from left to right on the same spin and you can look forward to a payout of 5, 10 or 50 times your bet. You’ll also trigger the game’s Free Games feature and with it, 10 free spins. Those free spins take place on a special set of reels where all of the lower value royal values have been removed from play. You can also retrigger the feature again and again. Vampire Fortunes also offers a shot at landing 1 of 4 jackpot prizes. The Jackpot feature can be triggered on any spin that includes a wild. You’ll then be offered the pick of 12 objects. Behind each one is a coloured gem – find 3 that match and you’ll trigger the associated Mini, Minor, Major or Grand Jackpot. This is a typically simple video slot from Novomatic. The design here is actually pretty good. The soundtrack features the usual bangs and bleeps which are complemented by the occasional howl, screech and orchestral blast. It all comes together well. There’s nothing very complicated about the gameplay here. Again, it’s rather good, especially if you like volatile action. If you’ve already played Pyramid Fortunes, you’ll have a good idea of what to expect here. The design and gameplay are very similar only the theme is horror rather than ancient Egypt. 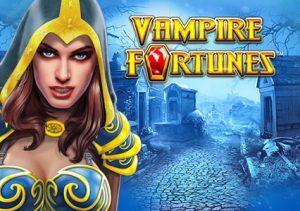 Offering decent design, straightforward gameplay and high variance action, Vampire Fortunes doesn’t offer enough bite for me – I’d rather play NetEnt’s Blood Suckers II which is better in many ways.